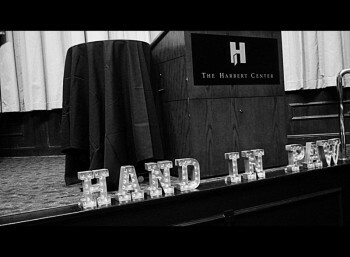 Vendors and volunteers of all ages swiftly entered The Harbert Center Saturday,August 15th to set up for a large event benefiting Hand in Paw that would take place later that evening. several paintings and other exquisite items. om a child who is so beautifully affected by Hand in Paw. accents to add just the right amount of shine. The space used for dinner and the Live Auction was Beeson Hall, which is perfect for large events such as this one. The room is so open and is set as a blank canvas for true creativity to complete it. “Hand in Paw’s Picasso Pets 15th Annifursary” was such a fun event for such a great cause! The Harbert Center always loves hosting such purrfectly planned events like this one!